The etymology of the word Zion (ṣiyôn) is uncertain. Mentioned in the Old Testament in the Books of Samuel (2 Samuel 5:7) as the name of the Jebusite fortress conquered by David, its origin likely predates the Israelites. If Semitic, it may be derived from the Hebrew root ṣiyyôn ("castle") or the Hebrew צִיָּה ṣiyya ("dry land", Jeremiah 51:43). A non-Semitic relationship to the Hurrian word šeya ("river" or "brook") has also been suggested. The form Tzion (Hebrew: ציון‎; Tiberian vocalization: Ṣiyyôn) appears 108 times in the Hebrew Bible, and once as HaTzion. It is spelled with a tsade and not zayin. The commonly used English form is based on German orthography, where z is always pronounced [t͡s] (e.g. "zog" [t͡soːk]), hence "Zion" in German literature. A tz would only be used if the preceding vowel is short, hence the use of Zion in 19th-century German Biblical criticism. This orthography was adopted because in German, the correct transliteration can only be rendered from the one instance of HaTzion in Kings II 23:17, where the a vowel is followed by a double consonant tz. Zion is the Hebrew name for a hill south of the Temple Mount in Jerusalem, upon which was built the City of David. In its most specific sense, Mount Zion is not to be confused with Mount Moriah, better known as the Temple Mount, upon which the Temple of Solomon and the Second Temple were built. The location of the Temple, and in particular its Holy of Holies (innermost sanctum), is the most holy place in the world for the Jewish people, seen as the connection between God and humanity. Observant Jews recite the Amidah three times a day facing the Temple Mount in Jerusalem, praying for the rebuilding of the Holy Temple, the restoration of the Temple service, the redemption of the world, and for the coming of the Messiah. Mentioned 26 times in the Tanakh, the biblical phrase "Daughter of Tzion" (Hebrew "bat Tzion") is not a reference to Moriah in Jerusalem, nor to the hill upon which the old City of David was built in the immediate south of Mount Moriah, but rather to the women of the entire biblical Land of Israel and, thus, of Jewish peoplehood as a whole, including the Jewish diaspora. Within the Latter Day Saint movement, Zion is often used to connote a utopian association of the righteous. This association would practice a form of communitarian economics called the United Order meant to ensure that all members maintained an acceptable quality of life, class distinctions were minimized, and group unity achieved. [not verified in body] While Zion has often been linked with theocracy, the concept of Zion did not theoretically require such a governmental system. [not verified in body] In this way, Zion must be distinguished from the ideal political system called theodemocracy which Latter Day Saints believed would be adopted upon Christ's Second Coming. 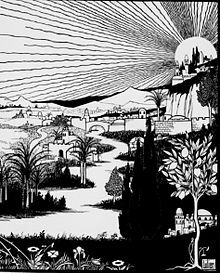 Ṣahyūn (Arabic: صهيون‎, Ṣahyūn or Ṣihyūn) is the word for Zion in Arabic and Syriac. Drawing on biblical tradition, it is one of the names accorded to Jerusalem in Arabic and Islamic tradition. A valley called Wādī Sahyũn seemingly preserves the name and is located approximately one and three-quarter miles from the Old City's Jaffa Gate. For example, the reference to the "precious cornerstone" of the new Jerusalem in the Book of Isaiah 28:16 is identified in Islamic scholarship as the Black Stone of the Kaaba. This interpretation is said by ibn Qayyim al-Jawziyya (1292–1350) to have come from the People of the Book, though earlier Christian scholarship identifies the cornerstone with Jesus. In Rastafari, "Zion" stands for a utopian place of unity, peace and freedom, as opposed to "Babylon", the oppressing and exploiting system of the materialistic modern world and a place of evil. It proclaims Zion, as reference to Ethiopia, the original birthplace of humankind, and from the beginning of the movement calls to repatriation to Zion, the Promised Land and Heaven on Earth. Some Rastafari believe themselves to represent the real Children of Israel in modern times, and their goal is to repatriate to Ethiopia, or to Zion. The Ge'ez-language Kebra Nagast serves as inspiration for the idea that the "Glory of Zion" transferred from Jerusalem to Ethiopia in the time of Solomon and Sheba, c. 950 BC. Rastafari reggae contains many references to Zion; among the best-known examples are the Bob Marley songs "Zion Train", "Iron Lion Zion", the Bunny Wailer song "Rastaman" ("The Rasta come from Zion, Rastaman a Lion! "), The Melodians song "Rivers of Babylon" (based on Psalm 137, where the captivity of Babylon is contrasted with the freedom in Zion), the Bad Brains song "Leaving Babylon", the Damian Marley song featuring Nas "Road to Zion", The Abyssinians' "Forward Unto Zion" and Kiddus I's "Graduation in Zion", which is featured in the 1977 cult roots rock reggae film Rockers, and "Let's Go to Zion" by Winston Francis. Reggae groups such as Steel Pulse and Cocoa Tea also have many references to Zion in their various songs. A World War I recruitment poster. The Daughter of Zion (representing the Hebrew people): "Your Old New Land must have you! Join the Jewish regiment." The term "Zionism", coined by Austrian Nathan Birnbaum, was derived from the German rendering of Tzion in his journal Selbstemanzipation (Self Emancipation) in 1890. Zionism as a political movement started in 1897 and supported a "national home", and later a state, for the Jewish people in Palestine. The Zionist movement declared the re-establishment of its State of Israel in 1948, following the United Nations Partition Plan for Palestine. Since then and with varying ideologies, Zionists have focused on developing and protecting this state. The last line of the Israeli national anthem Hatikvah (Hebrew for "Hope") is "....Eretz Zion, ViYerushalayim", which means literally "The land of Zion and Jerusalem". The Jewish longing for Zion, starting with the deportation and enslavement of Jews during the Babylonian captivity, was adopted as a metaphor by Christian black slaves in the United States, and after the Civil War by blacks who were still oppressed. Thus, Zion symbolizes a longing by wandering peoples for a safe homeland. This could be an actual place such as Ethiopia for Rastafari or Israel for some of the Igbos in Nigeria for example. For others, it has taken on a more spiritual meaning—a safe spiritual homeland, like in heaven, or a kind of peace of mind in one's present life. Abbey of the Dormition on the modern Mount Zion. Today, Mount Zion refers to a hill south of the Old City's Armenian Quarter, not to the Temple Mount. This apparent misidentification dates at least from the 1st century AD, when Josephus calls Jerusalem's Western Hill "Mount Zion". 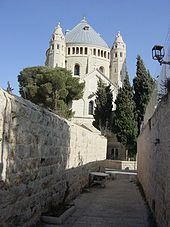 The Abbey of the Dormition is located upon the hill currently called Mount Zion. ^ Image published in Ost und West, Berlin, January 1902, 17-18. ^ a b c Longman, Tremper; Enns, Peter (2008). Dictionary of the Old Testament: Wisdom, Poetry & Writings: A Compendium of Contemporary Biblical Scholarship. InterVarsity Press. p. 936. ISBN 978-0-8308-1783-2. ^ a b c Anderson, Arnold Albert (1981). The book of Psalms. Eerdmans. ISBN 978-0-551-00846-5. ^ a b Bromiley, Geoffrey W. (1995). The International Standard Bible Encyclopedia. Wm. B. Eerdmans Publishing. p. 1006. ISBN 978-0-8028-3782-0. ^ a b Palestine Exploration Fund (1977). Palestine Exploration Quarterly. Published at the Fund's Office. p. 21. ^ a b Gil, Moshe (1997). A History of Palestine, 634-1099. Cambridge University Press. p. 114. ISBN 978-0-521-59984-9. ^ Freund, Richard A. (2009). Digging Through the Bible: Modern Archaeology and the Ancient Bible. Rowman & Littlefield. p. 141. ISBN 978-0-7425-4645-5. ^ a b Wheeler, Brannon M. (2002). Moses in the Quran and Islamic Exegesis. Psychology Press. p. 89. ISBN 978-0-7007-1603-6. ^ "Definition of Babylon (chiefly among Rastafari)". Oxford Dictionaries. Oxford University Press. Retrieved 22 March 2013. ^ "What Do Rastafarians Believe". Jamaican Culture. Jamaicans.com. 2003-05-30. Retrieved 22 March 2013. ^ Pixner, Bargil (2010). Paths of the Messiah and Sites of the Early Church from Galilee to Jerusalem: Jesus and Jewish Christianity in Light of Archaeological Discoveries. Ignatius Press. p. 321. ISBN 978-0-89870-865-3. "Zion". The Church of Jesus Christ of Latter-day Saints. Ludlow, D. H. (Ed.) (1992). Vol 4. Encyclopedia of Mormonism. New York: Macmillan Publishing Company. McConkie, B. R. (1966). Mormon Doctrine. (2nd ed). Utah: Bookcraft. Steven Zarlengo: Daughter of Zion: Jerusalem's Past, Present, and Future. Dallas: Joseph Publishing, 2007. Batto, Bernard F.; Roberts, Kathryn L. (2004). David and Zion: Biblical Studies in Honor of J. J. M. Roberts. Winona Lake, Ill.: Eisenbrauns. ISBN 1-57506-092-2.